UNITED NATIONS, June 23 -- Human rights such as the right to information, while often preached by the UN and enshrined in UN treaties, do not apply to the UN itself, Ban Ki-moon's spokesperson argued on Friday. "We are an association of member states," the UN spokesperson said, in response to Inner City Press' question if Ban rejected the human rights argument made to him by the Committee to Protect Journalists, that the UN should let in reporters from places, like Taiwan, which are not UN members. "He does not reject that argument," Ban's spokesperson said. It's just that he "cannot go against the will of the majority of the General Assembly," in this case what's called the One China policy. Video here, from Minute 13:45. At the level of member states, human rights are often invoked to question and overturn laws enacted by national legislatures. But the club of member states, which doubles as preacher of human rights, does not have to obey. There is apparently nothing higher than the votes of the General Assembly and, above that, of the Security Council, where five members, including China, have a veto. So one might say that human rights exist, to the extent that they do, only as allowed by the Permanent Five members: the U.S., France, Russia, UK and China. Even these countries' actions can sometimes be questioned, in the UN Human Rights Council or, for signatories, in the International Criminal Court. But the UN is not bound by human rights, even its own treaties. The Secretary General can agree with, or at least not disagree with, a human rights argument, and still not implement it. Similarly, the UN does not implement the human right principles it says its it promoting to corporation (click here for that), and argues it is immune from human rights lawsuits, most recently about Srebrenica. 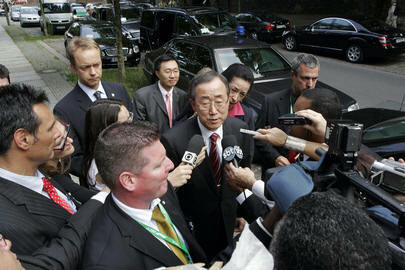 Two things the UN needs and could benefit from: transparency and accountability. Inner City Press: there was a letter that the Committee to Protect Journalists says it submitted to Ban Ki-moon raising concerns about the practice of only accrediting journalists from States recognized by the General Assembly, saying that violates some human rights conventions. Has that letter been received and what is his response to that complaint? Spokesperson: The letter was received last night. I transmitted it to him. He was, of course, traveling, so he�s not yet aware of the letter. Inner City Press: On that letter by the Committee to Protect Journalists about accreditation. Is there now a response by the Secretariat as to whether journalists from all over the world, whether or not from a country accredited by the General Assembly, should be allowed to cover the United Nations? Spokesperson: As I said to many of you before, the letter refers to a specific issue and the CPJ letter, and the decision that was taken by the General Assembly on the 'One-China' policy is a decision that holds. And the fact that it was a decision taken also that no journalist coming from a country that is not accredited at the UN -- that is not a Member of the United Nations -- would be accredited here. Inner City Press: So the argument they make that human rights conventions saying that everyone has the right to freedom of information and to cover, he rejects that human rights argument? Spokesperson: He does not reject that argument, but we are an association of Member States. And that you have to remember. The Secretariat has limited functions and the Secretariat cannot go against the will of the majority of the General Assembly.